The Coasters found themselves 2-0 down after just 24 minutes at Brisbane Road on Tuesday. 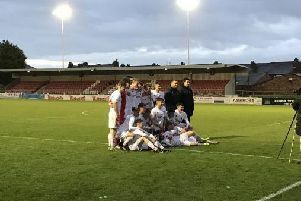 Challinor’s men were unable to get a goal back and that scoreline remained, leaving Fylde fifthplace in the National League, nine points behind the table-topping O’s. The Fylde boss said after the match: “We didn’t start the game, so there are some frustrated people in the dressing room. “For me, it’s not going around whacking people – it’s about competing and showing your intent early on. “We weren’t aggressive enough. We didn’t win enough first balls or second balls and that put us on the back foot. “Ultimately when they were on top they’ve got the goals. It was very reminiscent of the play-off game last season against Boreham Wood, where we find ourselves 2-0 down with 20 minutes gone and with a mountain to climb. “The difference was we got a goal back in that game. Oonce you get one, it makes teams think and it makes players think, but we didn’t do that. 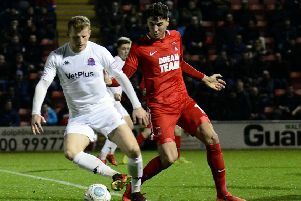 Challinor opted to change Fylde’s system from the weekend’s thrilling FA Trophy win, operating with Zaine Francis-Angol and Lewis Walters as wing-backs. But the change backfired, and after those two early goals a comeback never looked on the cards. Explaining the change, Challinor said: “Having watched what they do, you have a choice whether you match them up and simplify the roles of our players or stick with our four and make the game wide open. “Ultimately you want to start the game and make things simple, with the thought process of potentially changing our shape as the game progresses and ask them questions. “It backfires because we don’t do our jobs in the first 20 minutes and we concede. The biggest frustration is that we concede from two restarts. “We concede from a corner, which is a nothing ball into the box and is a really cheap goal. Then we have a throw-in 25 yards from goal, we dally on the ball and we end up giving a penalty away.